‘In the not too distant future wars will no longer exist. But there will be Rollerball’. 1975 and the posters for this Norman Jewison film were in every Underground station in London. Everyone seemed to have heard about it but sadly I was too young to be able to see it at the time. I had to wait until Derann released the two separate 400ft extracts as part of their United Artists deal. My brother and I hired these reels from our local film library and we had a terrific film show with all our friends from school in attendance paying the princely sum of 35p each to contribute towards the cost of the film. Not bad eh? When my colleague at work started using the internet and specifically the German ebay site to look for films I became interested. We ran the ‘Zelluloid’ link through the AltaVista translator and one of the first titles to grab our attention was ‘Scooterball’. 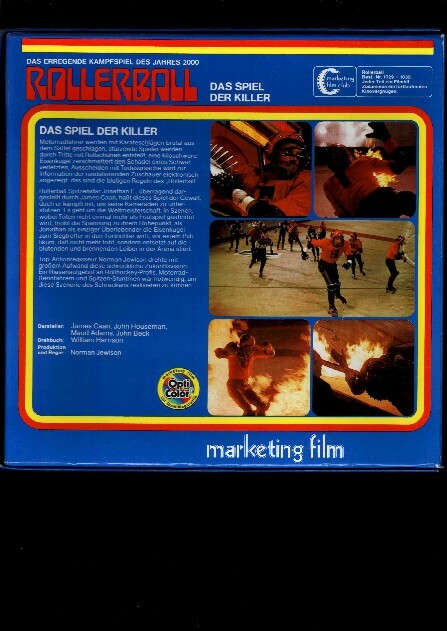 This has given us no end of amusement and to all at work Rollerball is now known by its erroneous translation. Rollerball has just been re-made and will appear in cinemas soon. Although it is hard to see how the original concept can be improved upon. 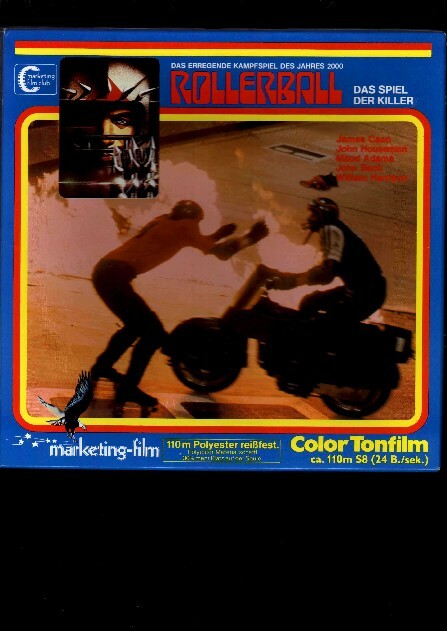 No doubt the skaters will be wearing rollerblades in the remake and the action will be faster but the most impressive feature about the original was the amazing stunt work filmed live. 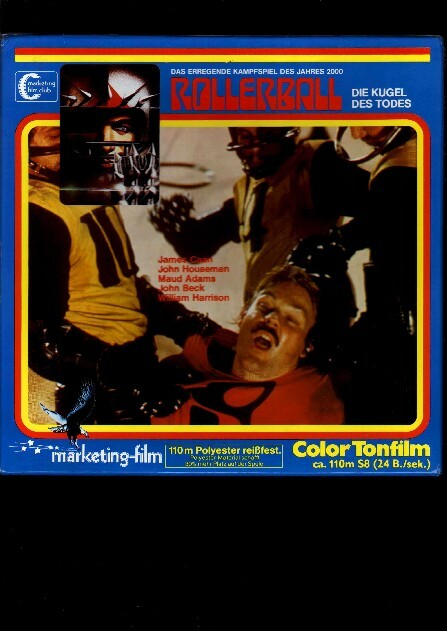 The stunt men enjoyed the game so much they carried on playing even when the cameras were stopped, and when they were running often forgot the action was supposed to be scripted. How prophetic the film was too. Multivision replaces ordinary television with four screens instead of the single screen. This is already possible with the new digital television services (player-cam for example). Corporations taking over the world – Microsoft perhaps? History being re-written to suit the modern world. Widespread and acceptable drug abuse. Promotion of a sport to vent the frustrations of the populace (football, American football etc.). Essentially it’s all about control of the masses and was an alarmingly accurate portrayal of a future which has arguably already arrived. Now where can I join a Rollerball team? This Marketing Films edition of the film is vastly different from the Derann release. This version tells the whole story sequentially – and does it very well too. The traditional Marketing letraset titles lead into the opening game with the film’s hero Jonathan E. (James Caan) leading out Houston against visiting Madrid. The object of the game is to collect a metal ball fired into the outer gutter perimeter of a giant banked circular track and deposit it in the single goal. Three motorbikes per team are used to speed the skaters around the track. Anything goes and players are maimed along the way. Houston win the game convincingly and this is where Jonathan E.’s problems begin. Houston is run by the Energy corporation and in charge is Mr. Bartholomew (John Houseman). The film cuts to the party where a worldwide multivision broadcast highlighting Jonathan’s fantastic career is playing. We learn that this broadcast was intended to announce his retirement and Mr. Bartholomew is not happy with him. As a result the rules of the game are to be changed permitting only limited substitutions and no penalties. This means teams can adopt far more violent tactics and hopefully along the way end Jonathan’s career. He still refuses to retire. The second game is against Tokyo in Japan. Jonathan’s best friend and team mate Moonpie (John Beck) is killed in this game which spurs Jonathan into a scoring spree. Again Houston win the game but at a cost to personnel. The game has become secondary to the violence and the crowd loves it. Jonathan’s ex-wife Ella (Maud Adams) is sent to plead with him to retire prior to the third game in the film and final game of the season. She explains that in addition to the previous rule changes there won’t be any time limit and everyone will die. Still he plays on. And this last game, with the exception of four quick cuts, is included in its entirety. By the end of the game the crowd has gone completely quiet such is the disgust with the barbarity they have witnessed. Jonathan is the last man standing and he has won the game. He is the hero and the worldwide audience knows it. A single man has taken on the establishment and come out on top. 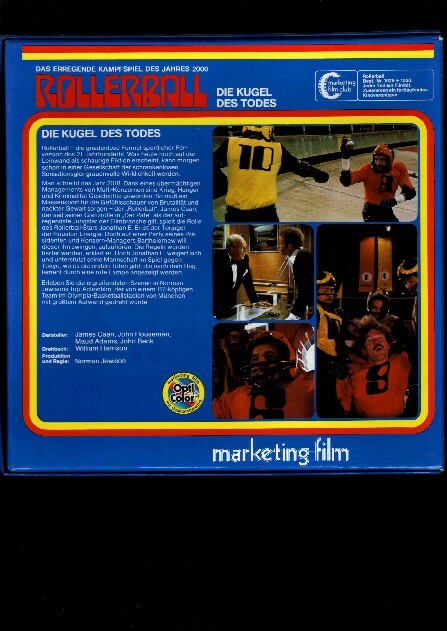 The one problem with this release is it was only available in Germany and so sports German sound. Not only can I not understand a word of it but the quality is not particularly good either. Thank goodness for the stereo DVD and re-recording capabilities. We now have a rather impressive stereo master which has already been put on two copies of the film. The print quality is very good. Not as good as a the best modern release but still very good nevertheless. But the good news does not stop there; if you want an extended feature length version of the film this is possible by splicing in the different sequences from the original Derann release. The result of this is a 45 minute (approximately) cut-down including an extended opening game, the second game with hardly anything missing and the final game unclipped. In addition there is more of the backroom dealing by Bartholomew with other executives running corporations around the world, plus the original front and end titles. Of course, the Marketing release was done on Fuji stock and is much thinner but amazingly the first tests carried out have resulted in the film staying in focus through the splices. Shouldn’t this be impossible?